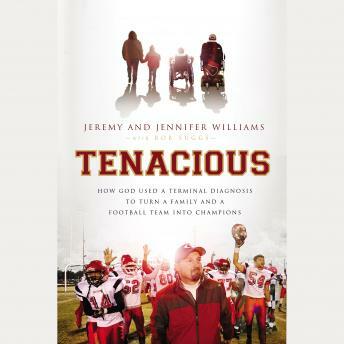 JeremyWilliams captured the nation's imagination by coaching his high school footballteam to unprecedented heights while combating ALS and caring for a son withspina bifida. This is his family's inspiring story. The distraught parents learning their son would be born with spina bifida.The young father facing his own devastating diagnosis of ALS (Lou Gehrig's disease) with matter-of-fact courage.The coach who guided his underdog team to a 10-0 Cinderella season-while struggling to walk, talk, and even breathe.Packed fullof faith, hope, love, and miracles, Tenacious is a story you don't wantto miss.